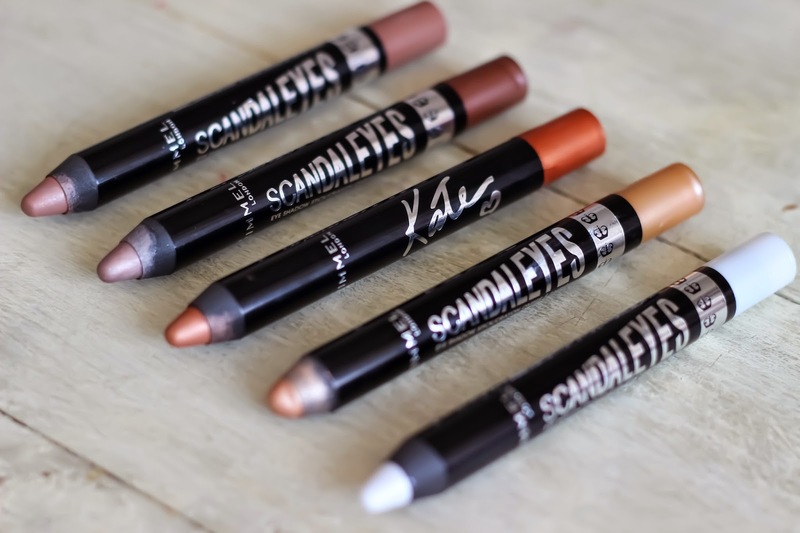 Does anyone else remember when these came out how disappointing the shade range was? There was I think one neutral shades & a black, a blue and a purple....something like that. That seemed to be enough for most people to discount them. But then I used them in my chronically ill prom tutorial, I noticed that there are a LOT more shades now & there's a matte formula too. So, what are these like? Were we wrong to write them off? Formula wise these pencils are very light, especially compared to the other budget shadow pencil I've used (NYX Jumbo Pencil). My eyelids are quite oily so they do crease a little, even when set, but again...compared to the NYX Jumbo Pencil......well there is no comparison, these last a lot better & don't crease anywhere near as much. The formulas I have these in 5 shades which are (from bottom to top) 001 Witness White (which may have been one of the original shades) 002 Bulletproof Beige, the new Rose Gold shade from the Kate Moss collection (number 100), 011 Bluffing & 015 Trespassing Taupe which is one of the matte shades. Witness White is slightly iridescent or...I don't know, shimmery or brightening or something. I was hoping it would be a dupe for the NYX jumbo pencil in milk but it's not really. It is a white pencil but it doesn't have the solid matte quality to it that makes the NYX pencil such a good base for bright shadows. This actually reminds me more of the Mac Vanilla Pigment that I love so much & so it's a great inner corner highlight & - if you have super pale skin like me - you could even use it as a stick highlighter underneath your foundation. Bulletproof Beige is the pencil I've had for the longest & I kind of lost it in my collection after these first came out. I'm not really sure why, the shade is a lovely warm, gold-ish champagne-ish colour. Under some lights it has an almost peach-y colour. It's almost a shame that this is a cream shadow because the colour is so lovely on it's own you don't want to have to set it...that's what translucent powers are for I guess. Rose Gold is the Kate Moss shade that actually looks cute, I mean the other shades are a blue, a turquoise & a purple...which is all very well & good but I'm sure I'm not the only person out there for whom shades like that would be completely useless. This rose gold shade is so pretty....more a copper than a proper rose gold. Still really stunning though. Bluffing is like a cream version of Satin Taupe from Mac, an iridescent grey, taupe brown with a slight golden-y shimmer. A great, no effort, all over the lid type shade...it's really cute. It is perhaps a little lighter, a little more tan than Satin Taupe. I love this kind of shade because it could be used as the base for almost any kind of look. Trespassing Taupe is the matte shade, this formula applies a little bit thicker & is a little bit less blendable....I feel like the matte texture means that it sets super quickly. Still not a bad formulation & the matte texture is very unique in cream shadows like this. The colour is darker & browner than bluffing but it still has that taupe undertone. 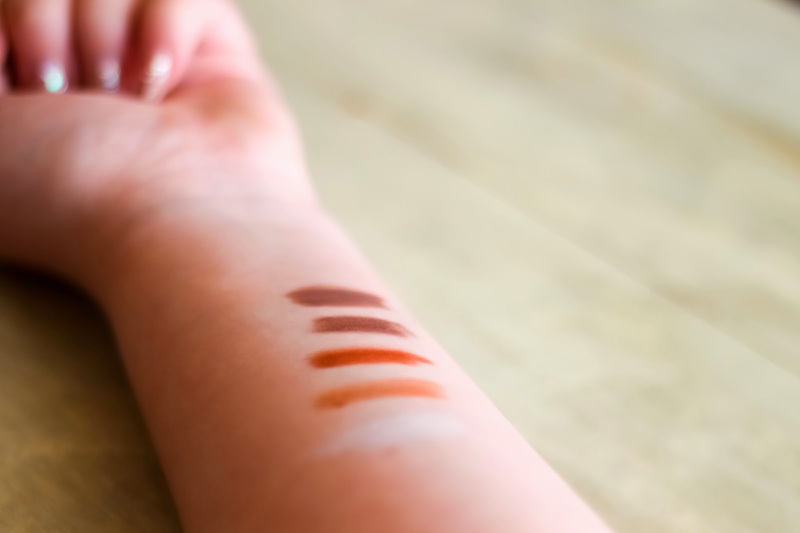 It's definitely a very neutral brown & a kind of medium level of darkness...not pale or soft but not really something you'd use as a liner either...something like a soft outer corner shadow or dark lid colour. Possibly even a passible cream contour colour if you blended it fast...and were a darker than me. You will have to set the shades with shadow or powder to make it last & that could mess with the shades...you may have to get a translucent powder to use with these. Would I buy it again? I think I would, it makes eye-makeup super easy & the shades are super cute. Ooo these look great.. might have ti pick one up! Oooooh these look good. Will have to take a look.